Every so often an image in a conflict zone is lifted out of its immediate context, takes on iconic status and is widely circulated. In today’s terms, “it goes viral”. Before the internet, two such images stand out: in 1972, the photograph of the nine year old girl in Vietnam, Kim Phuc, running down a road, her naked body burning from napalm; and in 1969, the self-immolation of the Czech student, Jan Palach, in protest against the crushing of the Prague Spring by Soviet troops. Both images still have currency as historic symbols of the particular conflict of which they were a part. On the 2nd of September this year, photographs of a drowned, three-year-old Syrian child, Aylan Kurdi, on a beach in Turkey, were published worldwide and, by means of social media especially, became a universal symbol of the refugee. Thousands have drowned since the beginning of the year in attempting to reach Europe but this single image tapped into the consciousness of millions of people. An extraordinary wave of sympathy and compassion followed almost immediately and, suddenly, mainstream newspapers, dominated by mostly negative coverage of asylum and refugee issues, began to change their narratives in accordance with what they, correctly, perceived as a humane public response. The European Journalism Observatory (EJO) carried out cross-border research into this changing narrative. In the UK, the newspapers sampled were liberal-Left (The Guardian), conservative (The Telegraph) and tabloid (the Daily Mail). In the first instance, there was an unusual congruence among all three, each carrying stories with a humanitarian inflection and with more than double the number of positive refugee stories two days after 2 September than in two days earlier. This was a real cause for optimism among those working with refugees and asylum-seekers as it seemed to signal a distinctive shift in the stories circulated by the media and perhaps indicated that the hostility and indifference towards refugees was about to undergo a transformation. Unfortunately, and, perhaps, predictably, this optimism was short-lived as, within a week or so, the narrative had reverted back almost to the level of the previous negativity. The ‘bubble’ of compassion had burst rather quickly and ‘the photo that has shaken Europe’ soon became yet another image among hundreds of others. Even if the positive coverage of refugee issues proved to be fleeting, there was, nevertheless, a significant growth in public and social media interest in matters of migration stimulated by the recurrent news of drownings and the ‘crisis’ brought about by the refugee camps in Calais, the so-called ‘Jungle’ camp in particular. 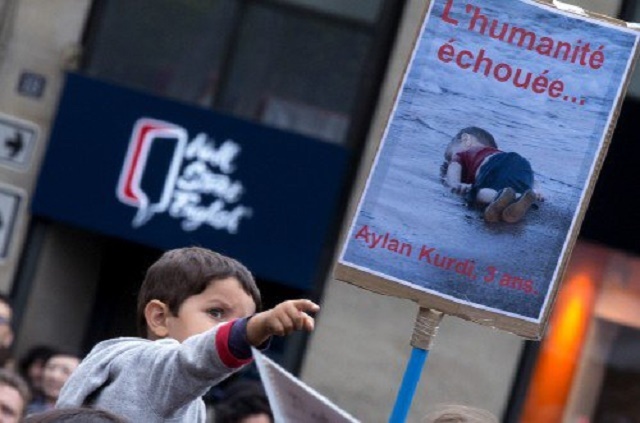 Undoubtedly, the response to the images of Aylan (often anglicised to ‘Alan’ to ‘localise’ him) was highly emotional and sentimental, and it would be easy to be skeptical about the depth of feeling aroused – British people are notoriously susceptible to tear-jerking stories about children and pets. However, what followed was an unprecedented, and quite unexpected, outpouring of, not just compassion and generosity, but also of a vast amount of offers of practical help and support, far surpassing a casual ‘like’ on Facebook or a hastily dashed-off tweet. There were countless examples of people being galvanised into all kinds of constructive action. What happened, I think, was a phenomenon which Judith Miller explored in her investigation of the Holocaust responses in six countries, One by One by One: Facing the Holocaust (1990), and that was the fact that few of us can make sense of a mass of images or of figures such as six million, but faced with a single image – one by one by one – of a specific refugee, especially a child, then empathy becomes possible. This is one specific way in which affect takes place. One local instance of this affect was that the Nottingham and Nottinghamshire Refugee Forum (NNRF, henceforth ‘the Forum’) collected £2,500 in under two hours at a ‘Welcome Refugees’ vigil in September, and has been inundated ever since with offers of clothing, food, and donations. Similar organisations throughout the country have reported comparable responses. There has been a marked increase in people coming forward to act as volunteers at the Forum and of families wanting to adopt refugee children, almost all specifying Syrian children, an effect, I suspect of the excessive media focus on this country at the expense of those suffering elsewhere and, perhaps, an unspoken sub-text about ‘genuine’ refugees. Even if people working in the field of refugee support are wary of this sudden rise in consciousness while, at the same time, trying to harness it for constructive ends, there is no doubt that a counter-narrative is taking shape, evidenced by the Charities Aid Foundation survey in late September which found that one in three UK adults had responded in some way to a relief effort, and one in 14 (the equivalent of almost two million households) would be prepared to offer space in their home to a refugee. This was a survey of adults, but a number of schools in Nottingham (and elsewhere, I am sure) have also raised money for refugees and have asked for people from the Forum to speak at assemblies and Harvest events. At one primary school where I spoke the children had, on their own initiative, organised a cake sale for refugees and raised a very generous amount of money for the Forum. Support for refugees is one of the school’s objectives throughout the coming year. Local churches have also given prominence to asylum matters. So, even if the media amplification of positive attention to refugees was temporary, popular support promises to be far more sustainable. Another example of this heightened public awareness was the petition to the UK Government to ‘accept more asylum seekers and increase support for refugee migrants in the UK’ gathered 444,167 signatures and generated a debate in Parliament which prompted Cameron to recommend the acceptance of 20,000 Syrian refugees mentioned earlier. Raising money is relatively easy, as is signing petitions, but, in addition to this, what has been most impressive is the number of groups set up to help those struggling in appalling conditions in Calais. In many cases, this has not been a one-off event but a recurring activity, and carried out, often, in areas where, traditionally, there has not been much activity around refugees, as far as I know, such as the ‘Ely Calais Refugee Action Group’, among numerous other examples. Even some commercial retailers have set up online facilities for sending equipment to Calais, sleeping bags, for example. All of what I have been describing is even more remarkable given the preponderantly negative media narratives of the past twenty years or so, some particularly aggressive far-Right anti-immigrant groups, and successive government policies designed to create ‘a really hostile environment’ (Theresa May’s words) for migrants through even harsher legislation. The ‘hostile environment’ is still very much in place but, as I said initially, the existence of what appears to be a far more positive public attitude to asylum seekers and refugee migrants seems to be gathering significant momentum. This momentum is, perhaps, not entirely unrelated to the ‘surge’ of support for the Green Party earlier this year and to the extraordinary energy and enthusiasm generated by Jeremy Corbyn’s successful campaign for the Labour Party leadership. A sense of optimism prompted a few of us in the Forum to arrange a conference to try to catch this new mood of ‘welcome’ to refugees by examining how stories around refugees seem to be undergoing change and, if this is true, how these changing narratives can be translated into action and sustained through campaigns around the media (including social media where support groups have proliferated), positive and enabling legislation, and refugee support in general. All of the above was written on Friday, 13 November. A few hours later, the tragic events in Paris unfolded. Immediately, I began to wonder how much of what I had written was now going to be rendered irrelevant. Borders were closed, emergencies declared, and Islamophobia had found a new pretext. A Republican congressman from South Carolina, Jeff Duncan, tweeted ‘How’s that Syrian refugee resettlement look now? How about that mass migration into Europe? Terrorism is alive and well in the world.#No.’ (He had obviously not noticed the slaughter In Beirut the previous day). Suzanne Evans, a prominent UKIP member, tweeted in similar vein, implying that the attackers were somehow linked to the recent migrant crisis. However unrepresentative and tastelessly opportunistic these tweets might be, they cannot be dismissed too readily as similar statements are already appearing and will continue. For example, the Mail on Sunday headline was ‘Paris Jihadis got in as Fake Refugees’ whereas the story actually used the formulation ‘were thought to have’, confirming the claim was entirely without foundation. ‘Fake refugees’ has become one of the mantras of the Far Right recently and has taken over from ‘bogus asylum seekers’. As a London student pointed out in a tweet later that evening: ‘To people blaming refugees for attacks in Paris tonight. Do you not realise these are the people the refugees are trying to run away from?’ This rational position will be hard to maintain in the face of claims that refugees are ‘terrorists’ under cover, especially amid claims one of the attackers may have used a fake Syrian passport. Within hours, a petition was circulating on social media asking the government to ‘Stop all immigration and close the UK borders until ISIS is defeated’, which has garnered 439,350 signatures at the time of writing. The number might not be representative but it is, at least, indicative. Calls will be made to join US air strikes in Syria or, possibly, for ‘boots on the ground’ as the West seeks its ‘pitiless’ revenge but this will only add to the flow of refugees from the region and further complicate the migrant ‘crisis’ in Europe. A brief survey of articles on the ISIS website, Ansarukhalifah, is sufficient to show that the polarization between the followers of the Khilafah (the caliphate) and the ‘Crusaders’ (not just the West of the non-believers but those Muslims in the so-called ‘grey zone’ who side with the Kufars (kafirs) and are labelled as ‘apostates’ and ‘hyprocrites’) is absolute. The shrinking of the ‘grey zone’ by recruiting from the ranks of the ‘apostates’ is part of ISIS strategy, so calls to close borders and stop immigration would play into their hands, as would increased Islamophobia. According to El-Baghdadi, ‘Islamist extremists are always on about how the West persecutes Muslims; the narrative is a key part of their ideology.’ It is doubtful whether this absolutist and militarised creed, with its medieval theology and post-modern technology, can ever be defeated by the Western powers militarily but it is surrounded by a host of non-Western forces in the ‘grey zone’ which may, ultimately, overcome it. There are no easy, quick answers to increasingly complex questions, partly because the attacks in Madrid, London, and, now, Paris were not on symbols of the State or political figures (both heavily protected) but on people going about their everyday business or pleasure in spaces which are virtually impossible to make secure against ‘terror’. This is part of ISIS’s strategy on a daily basis in the Middle East but this attack is the first time that the group has gone ‘global’, as Jason Burke put in The Guardian. Are these attacks really ‘for Syria’ (as one attacker was reported to have proclaimed), or are they simply to ‘terrorise, mobilise, and polarise’ (Jason Burke) in order to foment Islamophobia and to recruit ‘apostates’ to the Khilafah as a consequence? I do not know and it is beyond my competence to speculate, but it is certain that the far Right will be one of the main beneficiaries of the Paris attacks and that refugees in transit, and already here, will be faced with even thicker walls and higher fences, literal and metaphorical. All this means that the NNRF conference which we started planning in early October on a wave of optimism will now have to confront a fresh range of questions and challenges, a new set of stories, and will have to seek different frameworks of understanding as the basis for campaigns in the future.